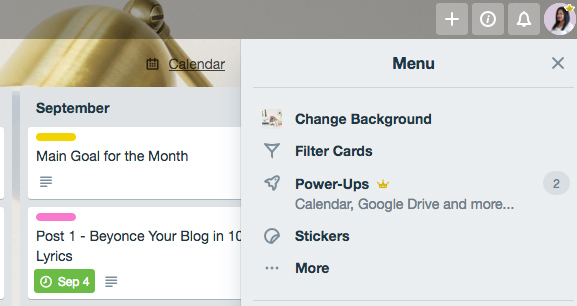 7 Ways to Use Trello as a Blogger — Lauren Myers & Co. There came a time in my blogging life where I needed to change a few of my processes, get more organized and start using digital tools. I physically love the act of writing, but trying to keep all my thoughts together in various notebooks and on random sticky notes was starting to impeded on my blogging process. I realized that using a digital tool to keep everything together was going to be the way to go. Fast forward 5 years and I’m an app, tools and systems junkie. I love the productivity and organization apps that I use to keep my blogging life (and even personal life) in order. I talk about Trello often on my blog because it’s the main hub for all of my content, products, projects, etc. When I talk to others about Trello, I sometimes get a glazed-over look or am told that it was overwhelming to learn it so they stopped trying. Since I want you to know and love Trello as much as I do, today I will be discussing the great features of Trello in hopes that you get a better understanding of how to use it as a blogger. Trello is a project management and organization tool where you can create tasks and plan out processes. Trello is made up of a board structure where you add various lists and cards to each board. So imagine it like a big whiteboard where you have a horizontal list of categories/topics and subcategories under each. Since task lists and project management are such broad subjects, I will the focus on how you can use Trello specifically as a blogger. When you blog, you have to keep everything organized so you will know what to work on, what’s due when and all notes related to each piece of content. This is why you should have an editorial calendar. You can use Trello to keep track of all future posts, add a due date, keep track of tasks that are needed to complete the post, and so much more. When you have a central location for all of your blog contents, you are instantly organized and feel more in control of your blogging life. You know the saying “Plan to plan”, right? This is incredibly important when it comes to your blog. Nothing is worse than wanting to work on a blog post but having no clue what to write about. Planning out your content in advance sets you up for success. I have one day a month where I plan out all content for the following month in what I call my Monthly Planning Session. When planning content, add it to your editorial calendar since this is the central hub of your blog. If you have a large project to tackle (new product/service, website redesign, online course creation, etc. ), it’s a great idea to dedicate one Trello board to all of its tasks and steps. Whenever I create a new product or service, I create a Trello board so I can plan it all out there. For example, when I rebranded at the beginning of 2018, I dedicated a Trello board to it so I could keep track of all that I needed to do to get the rebrand completed. Sometimes a project isn’t a huge one and won’t take long to complete. This is where you can use one board for all small projects. For example, you might want to DIY a coffee table. Instead of making one board to keep track of what to do, you can just create a list called “DIY Coffee Table” and list what to do in each card. I like to think of these types of projects as Sprints. Sprints are when you dedicate a two week period to one task. At the end of the two weeks, you start another small project. The idea behind Sprints is that you can focus your time on one project at at time to prevent overwhelming yourself with your entire list of projects that you need to complete. When you focus all of your energy on one thing for two weeks, you are more likely to complete it rather than having bits and pieces of multiple projects in progress and potentially not completing any of them. I have a Sprint board and I break mine out into Quarters. Planning out things to do is nothing if you don’t have a workflow. Workflows are a way to streamline a process and spend less time trying to remember each step. When you have a workflow for a process, it’s great to make a board documenting it. This can be for your reference or if you enlist outside help, they can view your workflow board to know your standard operating procedure. This is also great if you work with clients and have an onboarding and offboarding process. By documenting the flow in Trello, you can easily keep it organized and make quick changes when necessary. If you work with other bloggers for collaborations, using a Trello board for the project is a great way to keep everyone on track and on the same page. There are no surprises when everyone involved has visibility into the same system. You can add people to boards and assign cards/tasks to them which is helpful because everyone will know what’s complete and still pending. You can also leave comments on cards if you have feedback or notes to include for all to see. My friend Katrina and I use Trello to plan our collaboration blog posts together and to plan our Girlfriend’s Guide series weekend trips. It’s very helpful for keeping all details organized. If you want to keep your blogging life in order, you need to keep your personal life in order as well! I use Trello for personal organization for life events such as planning out trip itineraries, birthday party planning, holiday plans, etc. I also use Trello at my 9-5 to keep work projects organized in one central location. There are so many possibilities when it comes to Trello. A good rule of thumb in my eyes is if you start writing out a list of some sort...put it into a Trello board instead! These are a few ways that bloggers can use Trello. Depending on your niche, you can create boards based on what you blog about. So for a Fashion blogger, you can create inspiration boards including images so you can have more of a visual board. This would be the same for a Home Decor blogger. Trello boards would be a great way to keep home decor projects organized. The sky truly is the limit! What do you use to keep everything in your blogging life organized? Let me know in the comments!